Today we have the Eight of Arrows come out and join us. It’s keyword is “struggle” and is a totally new card. I did draw the Six of Stones first, so I hope no one else has died! 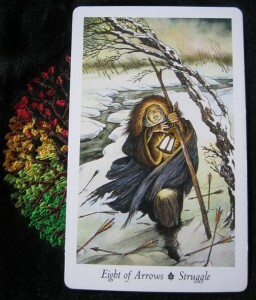 As you can see from the image of this card, it shows a woman, holding a lantern close to her, a staff for the support with eight arrows on the ground. Arrows in this deck are Swords in RWS, so I have a question already, which is: What else is she struggling with? The landscape is as cold and snowy as the deepest winter, yet the river still runs, her emotions still flow. The trees are bent from the wind and the woman is wrapped up in furs to keep the elements at bay. What is she struggling with, beyond the elements? In RWS, the 8 of Swords indicates self entrapment, but this has a totally different take on it. This woman isn’t entrapped, but she is struggling against her environment, the elements and as I often find as I go for winter walks, my thoughts. The card indicates that the woman has courage. I’ll say she does, in the adversity of all that she faces. The book indicates that the arrows were there before she walked upon them. Why were they there? What had happened there before? Why did she walk this path and why is she out in this weather? View this necessary sojourn with clear eyes and a resolute heart, for to overcome these tests of life makes us stronger. Now, can I clearly say: No thank you, not today?! Yeah, figured the universe wouldn’t listen. These obstacles are probably necessary. I’ve been clenching my jaw since yesterday after a few interactions and conversations about certain people. I don’t need a repeat today, thank you! And Clannad’s song, “Struggle” comes to mind (1:08 in). I realise now, at the end of typing this up, it follows on directly from yesterday’s insecurity. Yikes! Happy Valentines Day everyone!